The Chocolate Pavillion is one of a number of chocolate themed restaurants to have popped up in Brisbane in the past couple of years. Situated on Little Stanley street in South Bank it is very handy to both public transport and parking and is a great spot to sit and enjoy the night life while sipping some unbelievably delicious hot chocolate. I was lucky enough to be given a voucher for hot chocolate and a dessert plate for two. The Belgian hot chocolate came in a bewildering selection of different flavours (Classic Belgian, butterscotch, home made marshmallow, raspberry rumble, spicy chilli, mint madness, toffee nut, macadamia, orange and Turkish delight). This left me so paralysed with indecision that we ended up choosing by a coin toss. My husband orange and I had raspberry. The orange was very smooth and rich, like eating an orange creme chocolate. The raspberry was chocolatey but with a tangy berry aftertaste which I enjoyed. The Chocolate Pavillion also serve chocolate creme brulee in several flavours, which I think I may have to come back and try, as well as mochas, "hot choco-latte" (chocolate flavoured espresso), milk shakes and Belgian chocolate frappes. They even have chocolate cocktails! 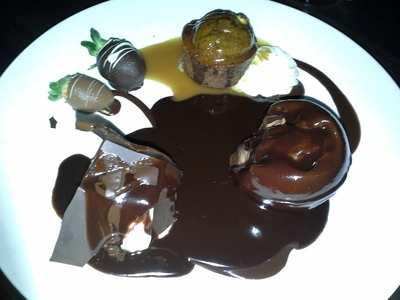 The dessert plate included a small sticky date pudding, some chocolate covered strawberries, a mini chocolate mud cake and a chocolate sphere. The sphere has a chocolate shell filled with parfait, and when it was served the waitress poured hot fudge over it and we watched it dissolve into a delectable gooey mess. It was all very rich and filling and I would recommend a light main course if you're going to be eating so much delicious dessert. The closest the Chocolate Pavillion comes to serving savoury food is stacks of pancakes and Belgian waffles so you may want to go elsewhere for something savoury first. Alternately you could do what we did and just call a gigantic plate of chocolate desserts your main course and then move on to cocktails afterwards. The whole experience felt gloriously decadent. If you're looking for something to take away there is also a retail area which sells things like champagne truffles and chocolate coated coffee beans. If you're enjoying an evening out in South Bank, the Chocolate Pavillion is definitely worth a visit. Is diversity in fiction important to you? Have you ever made cake mix and just eaten it? Are you a cancer survivor?